After years of making delicious Tassajara Bread Book biscuits for my family, I needed to adapt the recipe for a gluten-free diet. Giving them up was not an option. My second attempt was a triumph. But the third time was the charm! These babies have just the right texture. The crumb is light and buttery, yet holds together when sliced. There won’t be any left. 1. Combine flours, almond meal (optional), and xanthan gum, baking powder and salt in food processor until pea-size pieces are formed. Transfer to large bowl. Or cut butter or margarine into dry ingredients with a pastry cutter or two knives. 2. Make a well in the center of dry ingredients and add the eggs and milk. Beat the eggs and milk with a fork until smooth. Continue stirring with the fork, gradually incorporating flour until it is all moistened. 4. Gently shape dough into a 3/4-inch thickness. Do not use a rolling pin. Cut into rounds with a floured cutter or glass. Place on an ungreased preheated cast iron skillet or cookie sheet. 6. Bake at 425⁰ F for 10 minutes, until the bottoms are lightly browned and the tops golden. Do not overbake. 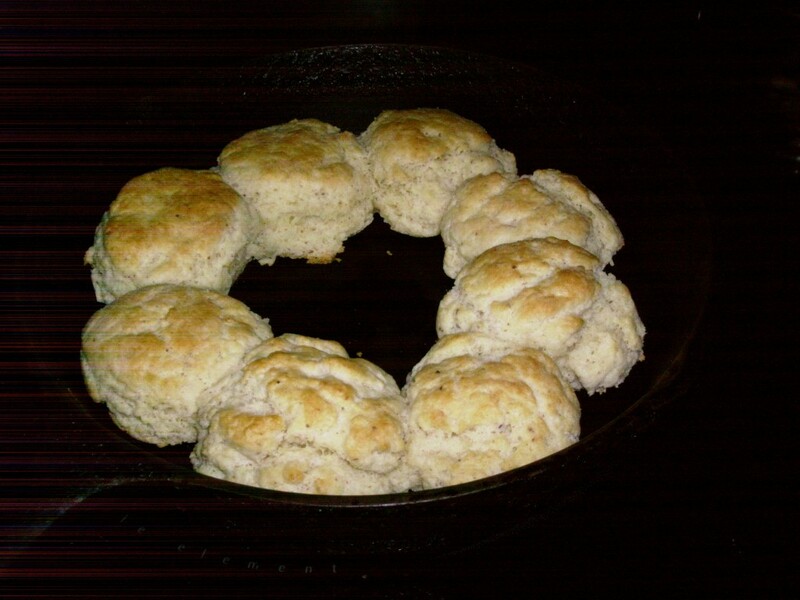 * BAKING TIP: For a crisper bottom, preheat a cast iron skillet for about 7 minutes before carefully transferring cut-out biscuits.